Introduction: Information on outcomes of pediatric renal transplantation in developing countries is limited to few single-center reports with small numbers. Methods: Medical records of patients who underwent kidney transplantation at a single tertiary care center were retrospectively reviewed for information on recipient and donor characteristics, immunosuppression, posttransplantation complications, anthropometry and graft and patient survival. Allograft and patient survival were estimated using Kaplan–Meier survival analysis; risk factors for acute and chronic rejection (AR and CR) and patient or allograft loss were examined using Cox regression. Results: During 1995–2017, 116 patients (84% boys) received 120 kidney allografts at the age of 13 ± 3.8 years, chiefly from live-related donors (76%). During median (range) 4.5 (0.8–19.5) years of follow-up, AR and CR were seen in 24% and 15.5% allografts. Ten (8.8%) patients died, chiefly due to septicemia, while 26 (21.7%) allografts were lost, most often to CR. Severe infections included septicemia (13%), urinary (23%) or respiratory tract (9%) infections, cytomegalovirus (11%), and chronic viral hepatitis (7%). At 1, 3, 5, 10 and 15 years, patient survival was estimated at 95.5%, 94.4%, 91.7%, 89.2% and 79.3%, respectively, while allograft survival was 92.2%, 87.2%, 85.6%, 77.6% and 77.6%, respectively. Final height, at −2.2 ± 1.3 standard deviation scores, was significantly improved from baseline (P = 0.001). Conclusions: Pediatric kidney transplantation in developing countries is associated with similar patient and allograft survival as compared to developed regions. While severe infections cause serious morbidity and mortality, rates of immunological complication are similar to developed regions. While patients show significant height gain, final stature is subnormal. Kidney transplantation is the preferred modality for renal replacement therapy (RRT) in children with end-stage kidney disease since it improves patient survival and enables satisfactory growth and quality of life.,, Advances in immunosuppression, surgical expertise, donor selection and improved peritransplantation care have enhanced patient and allograft survival in developed countries., Cumulative graft survival in pediatric recipients of deceased donor allograft approximates that in middle-aged adults and is higher than that in elderly and young adults. Pediatric renal transplantation in developing countries continues to be limited by the paucity of established transplantation services in public hospitals, lack of awareness and financial constraints., Infections remain an important determinant of posttransplantation morbidity and mortality. Outcomes across developing regions vary based on immunosuppression protocols, intensity of surveillance and potentially ethnicity or race. While studies from developed nations report improved growth during longitudinal follow-up,, there are no regional registries to collect information on growth, posttransplantation complications or patient and allograft survival. This study describes the post transplantation outcomes in a tertiary care hospital from North India with focus on complications and longitudinal growth, and compares them with data from other developing countries. 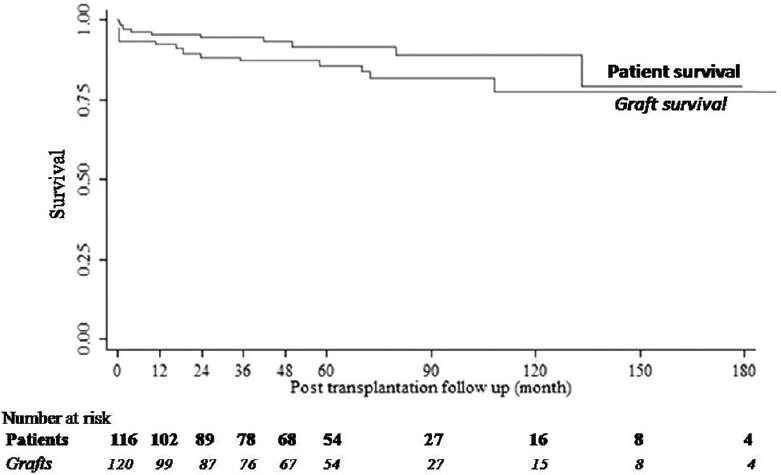 We previously reported medium-term posttransplantation outcomes in 45 patients in 2010 and in four patients transplanted following anti-factor H antibody associated hemolytic uremic syndrome. We reviewed records of all kidney transplantations performed under the care of the Departments of Pediatrics and Surgery, with support from other departments, at a single tertiary care center in north India, between January 1995 and June 2017. Clinical details and biochemical, microbiological, radiological and histological investigations were reviewed for data on native kidney disease, dialysis, donor characteristics, immunosuppression, posttransplantation complications, anthropometry and graft and patient survival. Recipients and blood group-compatible donors underwent standard clinical, laboratory, radiological, and immunological testing to confirm eligibility with standard transplantation criteria, including donor-recipient cross-match to rule out donor-specific anti-HLA and non-HLA antibodies as well as histocompatibility testing for HLA-A, -B, -DR and -DQ loci, as described previously. Donors were excluded if they were <21 years or >65 years old and had proteinuria, diethylenetriamine pentaacetic acid glomerular filtration rate (GFR) below 70 mL/min/1.73 m 2, obesity (body mass index >95th centile), hypertension requiring two or more drugs, diabetes or infection with HCV, HBV, or HIV. Recipients were considered ineligible in the presence of active infection with HCV, HBV, or HIV, inadequately managed bladder dysfunction, cirrhosis, severe neurological disability, high titers of antidonor antibodies or a positive cross-match. While all recipients underwent micturating cystourethrography, urodynamic studies were performed only if bladder dysfunction was suspected clinically or on imaging. Details of surgical approach and immunosuppression were described previously. Briefly, triple immunosuppression with cyclosporine, azathioprine and prednisolone was used until 1999, after which mycophenolate mofetil (MMF) replaced azathioprine, while tacrolimus replaced cyclosporine in 2005. The use of induction immunosuppression was uncommon before 2003. Subsequently, all children received an interleukin-2 receptor antagonist if families could afford it, as two doses on days 0 and 4, of either daclizumab (during 2003–2010) or basiliximab (2010 onward). In four children, steroid avoidance was achieved using nine doses of daclizumab over 6 months. Antithymocyte globulin ( ATG; for 3–5 days) was used as induction agent in patients at high risk of rejection (second transplantation; high titers of panel reactive antibodies) or delayed graft function (prolonged cold ischemia time in deceased donor transplantation); ATG enabled delayed initiation of calcineurin inhibitor (CNI) in the latter. Immunosuppression with cyclosporine and azathioprine was described previously. Tacrolimus (0.2–0.25 mg/kg/day) and MMF (1200 mg/m 2/day), in two divided doses each, were initiated 24 hr before transplantation, while induction agent and intravenous (IV) methylprednisolone were given just before surgery. The dose of tacrolimus was titrated to maintain trough level (measured by chemiluminescent assay) at 10–12 ng/ml in the first month, 8–10 ng/ml at 2–6 months, and at 5–8 ng/ml subsequently. The dose for MMF was reduced to 600 mg/m 2/day after therapeutic level of tacrolimus was achieved. The follow-up with investigations was conducted twice a week for 1 month, weekly for 3 months, monthly till a year after transplantation, and 2–3 monthly thereafter. All patients received cotrimoxazole for 3 months. Recipients seronegative for cytomegalovirus (CMV) at transplantation also received oral valganciclovir prophylaxis for 6 months. As described previously, hypertension was managed with amlodipine with or without a beta-blocker and angiotensin-converting enzyme inhibitor. Infections were diagnosed and managed using standard protocols. Delayed graft function was primary nonfunction of the graft, necessitating dialysis. Acute rejection (AR) was suspected in patients with graft dysfunction (>30% rise in serum creatinine) with or without fever and graft tenderness. After excluding vascular thrombosis, obstruction, infection and hypovolemia, where feasible, patients underwent allograft biopsy, which was graded for AR using Banff criteria. Therapy for rejection comprised IV methylprednisolone pulse at dose of 10 mg/kg/day for 3 days, followed by high-dose oral prednisolone that was tapered over weeks. Chronic rejection (CR) was diagnosed in the presence of persistent and slow decline in estimated GFR (eGFR) beyond 3 months of transplantation, with or without histological evidence of chronic allograft nephropathy. Graft loss was defined as persistent fall in eGFR to below 15 ml/min/1.73 m 2. Statistical analysis was performed using Stata version 11 (College Station Texas, USA). Depending on distribution, continuous data are expressed as mean ± standard deviation or median ( interquartile range) and compared using student t or Wilcoxon sign-rank tests. Categorical data are reported as number and percentage of patients or transplantations and compared using Chi-square test. Two-sided P < 0.05 was considered statistically significant. Graft loss and patient survival were determined using Kaplan–Meier survival analysis. Cox regression analysis was used to investigate the association of various risk factors to outcomes. During January 1995 to June 2017, 120 kidney transplantations were performed for 116 children (84.1% boys); this included four children who underwent second transplantation following allograft loss and a girl who received combined liver–kidney transplantation for primary hyperoxaluria type-1. Forty-five (37.5%) transplants performed in 2008 have been reported. 75 (62.5%) transplants were conducted in subsequent 9 years. [Table 1] shows the patient characteristics. The majority (63.2%) were older than 12 years; 6 (4.3%) patients were up to 5 years old at transplantation. Twelve (10%) transplants were preemptive. Mean age of living donors was 40.4 ± 6.0 years and were chiefly mothers (68%). There were 2.7 ± 1.1 HLA mismatches in the entire cohort. Induction therapy with either basiliximab or daclizumab was used in 52 (43%) and 20 (17%) transplants, respectively, while 38 (31.7%) transplants did not receive induction therapy. ATG was used in all children (10; 8%) who received kidney from deceased donor. Tacrolimus and cyclosporine were the initial choice among CNIs in 95 (79.2%) and in 25 (20.8%) patients, respectively. Cyclosporine was switched to tacrolimus in eight patients, including four each following cosmetic adverse effects and as rescue therapy following AR. Therapy was switched from tacrolimus to cyclosporine in eight patients, for new-onset diabetes after transplantation (NODAT; n = 4), recurrent focal segmental glomerulosclerosis (FSGS; n = 3) and neurological symptoms (n = 1). Initial immunosuppression included MMF and azathioprine in 98 (81.7%) and 22 (18.4%) cases, respectively. Therapy was switched from azathioprine to MMF in 14 patients, to contemporize therapy (n = 6), or for AR (n = 4) or azathioprine-induced neutropenia (n = 3) or hepatitis (n = 1). Two patients were switched to azathioprine for chronic diarrhea associated with MMF; MMF was discontinued in four patients with posttransplantation lymphoproliferative disease (PTLD) and one with BK virus-associated nephropathy. All four patients transplanted using a steroid-free regimen returned to prednisolone for histological evidence of CNI toxicity (enabling CNI reduction; n = 3) or borderline AR (n = 1). Posttransplant complications during follow-up of 61.6 ± 48.2 (range 8–234) months are listed in [Table 2]. Thirty-three (27.5%) episodes of AR were observed in 28 (24.1%) patients, with rejection ratio of 1.2, at 11 (3–24) months after transplantation. History of medication noncompliance was obtained in 6 (21.4%) patients. Of those biopsied, 19 (76%) had cellular and 6 (24%) had antibody-mediated rejection; three biopsies showed concomitant CNI toxicity. Five (17.9%) patients with AR developed CR. Of 18 (15.5%) patients diagnosed with CR at 30 (12–71) months, allograft loss was observed in 5 (27.8%) cases. While there were no identifiable risk factors for AR, poor compliance to therapy (P< 0.001), lack of induction therapy (P = 0.01), and occurrence of AR were the risk factors for CR on univariate analysis. 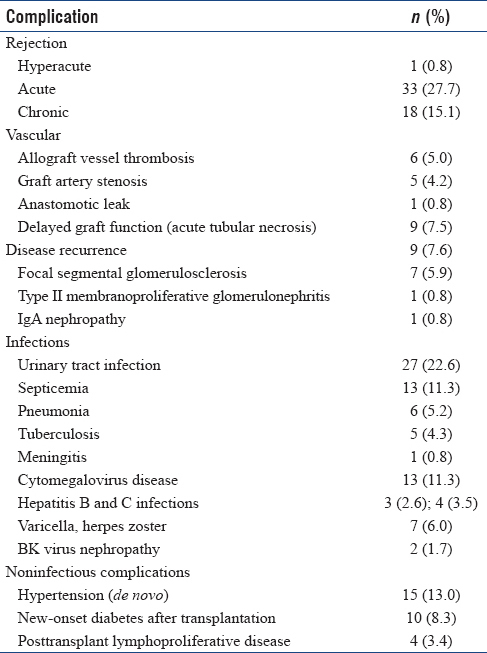 Significant infection was the most common complication following transplantation and was observed in 58 (50%) patients [Table 2]. Postoperative (<2 weeks after surgery) infections included septicemia (n = 4), urinary tract infection (UTI, n = 3), and pneumonia (n = 5). Seven (25.9%) of 27 patients with febrile UTI were initiated on antibiotic prophylaxis for recurrent UTI. Three of nine patients with septicemia during follow-up succumbed. Posttransplantation tuberculosis was either pulmonary (n = 2) or extrapulmonary (spinal, pericardial and splenic in one each) and responded satisfactorily to prolonged antitubercular therapy. Eight (61.5%) of 13 episodes of CMV disease occurred within 6 months of transplantation, and one of these succumbed to the illness; only two of 13 were seronegative for CMV at transplantation. Posttransplantation hypertension after transplantation included persistent hypertension in 61 of 77 patients who were hypertensive before transplant and 15 patients with de novo hypertension. Blood pressure control was achieved with one (62.6%) or two (37.3%) drugs. Seven of 10 patients with NODAT presented within 3 months of transplantation and the other three by 1 year after transplantation. PTLD was diagnosed in four patients 6–96 months after transplantation and involved diverse sites but had satisfactory outcome. Twenty-six (21.7%) allografts were lost during follow-up, including five deaths with functioning graft. Nine (34.6%) allografts were lost within 4 weeks of transplantation, due to renal vascular thrombosis and acute tubular necrosis (primary nonfunction) in three cases each, sepsis-related acute kidney injury in two patients, and hyper-AR in one patient. Other causes of allograft loss were chronic rejection (n = 5), recurrent FSGS (n = 4), refractory AR (n = 2) and recurrent membranoproliferative glomerulonephritis (n = 1). Allograft survival was estimated at 92.2%, 87.2%, 85.6%, 77.6%, and 77.6% at 1, 3, 5, 10 and 15 years after transplantation, respectively [Figure 1]. Allograft survival was better in recipients of living than deceased donor (94%, 90%, 88.3%, and 79.6%, vs. 78.6%, 72.9%, 72.9% and 72.9%, respectively; P = 0.05) organs and did not differ between patients with underlying glomerular and urological diseases (P = 0.97). On multivariate analysis, deceased donor transplantation (hazards ratio [HR] 1.10; 95% confidence interval [CI] 1.02, 3.09; P = 0.05) and chronic rejection (HR 2.10; 95% CI 1.12, 5.60; P < 0.001) were independently associated with allograft loss. Ten patients died after 66.2 ± 51.2 (range 0.07–268.4) months of follow-up. Seven deaths were secondary to sepsis while one patient each died due to uremia, intracranial bleeding and stroke. Patient survival was estimated at 95.5%, 94.4%, 91.7%, 89.2% and 79.3% at 1, 3, 5, 10, and 15 years, respectively [Figure 1]. There were neither patient characteristics nor complications specifically associated with death. Height standard deviation score (SDS) at transplantation, available for 94 (81.7%) patients, was −2.50 (−3.19, −1.25) [Figure 2]. Height SDS at transplantation was lower in boys (n = 77; −2.67 [−3.30, −1.82]) than in girls (n = 17; −1.25 [−2.59, −0.35]) (P< 0.001) and lower in those >12 years old (n = 58; −2.63 [−3.29, −1.7]) than younger (n = 36; −2.25 [−3.11, −1.04]) patients (P = 0.04). Six patients received therapy with recombinant growth hormone for 1 year or longer before transplantation, while two patients received such therapy beyond one year after transplantation. Final height SDS, significantly improved from baseline, was − 2.15 ± 1.33 (P = 0.001), and the increase was attributable chiefly to growth during the 1st year after transplantation [Figure 3]. The final height SDS was similar for boys and girls (−2.1 [−3.09, −1.1] vs. −2.14 [−2.72, −1.54]; P = −0.9) but significantly better for children aged >12 years at transplantation than children aged ≤12 years (−1.99, [−2.84, −1.05] vs. −2.79 [−3.50, −1.63]; P ≤ 0.001); the change in height SDS during follow-up was significantly higher for older than younger patients (0.43 [0.01, 0.93] vs. 0.085 [−0.89, 0.93]; P ≤ 0.001). The change in height SDS or final height SDS was not related to duration of chronic kidney disease (CKD) or dialysis or use of growth hormone pre- or post-transplantation. 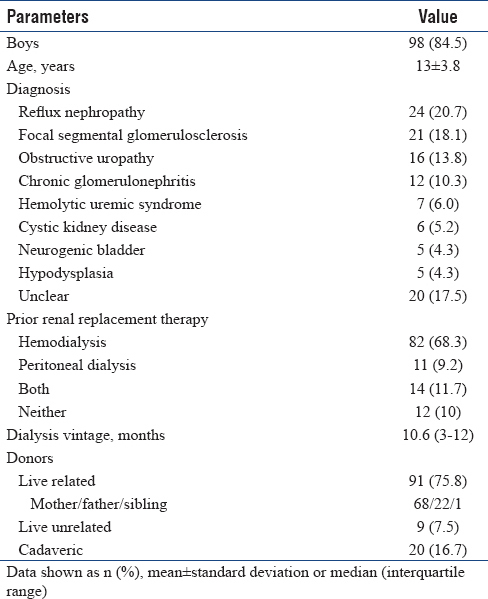 This manuscript summarizes more than two decades of experience with pediatric kidney transplantation at a single tertiary care center in a developing country. While the findings are not novel and confirm findings of our previous report, the report reassures, in a larger and recent cohort, that kidney transplantation in developing countries is associated with similar medium-term outcomes as developed regions,, emphasizing the need to replicate this experience across less privileged regions. It also confirms demographic characteristics of healthcare seeking unique to developing regions, particularly south Asia, and highlights the importance of infections in determining both patient and allograft outcomes. Further, we partially replicate the experience from developed countries in reporting gain in stature after transplantation, including among adolescents, suggesting delayed skeletal maturity among children with CKD. With increasing awareness, the annual number of transplantations performed at our center has more than doubled, from 3.4 to 8.3 transplants annually, since the 2010 report. Despite representing one of the larger transplantation experiences from south Asia,,,,, the number of transplants we report represents a fraction of those in need of RRT, reflecting the dearth of financial and social support to the majority of families living in low- and middle-income countries., Most patients were adolescent at transplantation, suggesting delayed presentation as well as the inability of most centers to offer, and for families to sustain, RRT in young children, confirmed in a national survey of transplantation practices. This finding mirrors reports from other developing countries,,,,[25 and contrasts with the North America  and United Kingdom  experiences, where a fifth of children were less than 6 years old. The male predominance of recipients and female predominance among donors likely reflect a sociodemographic trait unique to south Asia, also reported by others and in web-based survey,,,,, while the genders are represented more evenly in reports from the West., The principal causes of end-stage renal disease were congenital abnormalities of kidney and urinary tract (CAKUT) in younger children and glomerular diseases in older children, were comparable to reports from developed and developing regions.,,,,,,,,, However, presentation was often delayed, reflected in the older age at diagnosis of CAKUT and in the low rate of preemptive transplantation, which was half of that reported from developed countries., In the absence of an organized deceased donor program in north India, the majority of organs were from living donors, in contrast to reports from south-east and west Asia, UK, and North America. Immunosuppression protocols at our center have been contemporary to practices across the world., Induction immunosuppression, used in 68% of our patients, gained traction worldwide at the turn of the century, is recommended by expert groups in adults, but its application to pediatric patients has been guided by center policy and insurance coverage rather than evidence. Most developing areas report low rates of use,,,, and its use in North America has declined recently., While corticosteroid withdrawal is now routine in several developed regions,,, our limited experience with daclizumab-aided steroid-free immunosuppression was unsuccessful as low-dose prednisolone had to be initiated in all four children, usually within the first year. The use of ATG for deceased donor kidneys, at high risk of delayed graft function with increased cold ischemia time, was based on Western experience of improved outcomes with this strategy , and was not associated with increased risk of infections. Switch from tacrolimus to cyclosporine, reported useful in managing recurrent FSGS, NODAT  and tacrolimus-induced neurotoxicity, was associated with favorable response in 62.5% of 8 cases, similar to experience in adult liver transplant recipients; however, one patient each was switched back to tacrolimus following AR and hirsutism. With robust immunosuppressive regimens, the rates of AR have declined in both developed and developing countries, from 36.8% in 1997–2001 to 16.1% in 2007–2013 in North America  and from 35% in 1996–2005 to 17% in 2006–2011 in Pakistan. Over 1995–2017, AR was confirmed or suspected in 24.1% of our patients, which appears comparable with the estimates above. Rates of chronic allograft nephropathy may have been underestimated due to lack of histological surveillance or protocol biopsies. Similar to the experience from various developing countries, reviewed by Rizvi et al., and from North America, CR was a leading cause of allograft loss. Early graft failure, chiefly attributed to sepsis, thrombosis and AR, requires rigorous surveillance for infections, perioperative fluid status, renal dysfunction and levels of CNI. [Figure 3] shows that allograft survival in our cohort compared favorably with experience from other low- and middle-income countries,,,,,,,, and was similar to that reported from North America  and the UK. However, reporting of graft survival was not consistent; death with functioning graft was a nonimmunological cause of graft loss in some but not all reports. Reports from both developing and developed countries suggest significantly improved outcomes for allografts received from live donor compared to deceased donors;,,, similarly, we found that deceased versus live donor transplantation was associated with reduced allograft survival and was independent of other variables on multivariable analysis. [Figure 3] suggests that patient survival in our cohort was lower at 1 and 5 years than reported in developed regions  and some developing countries,,, but 10-year survival was comparable.,, Unlike in NAPRTCS database where cardiovascular disease was the leading cause of death in posttransplantation period, infections were the most common cause of mortality in the present report and in studies from other developing regions, reflecting the high incidence of infections associated with tropical climate, overcrowding, poor hygiene and inconsistent infection surveillance policies.,, While infections are also encountered in developed regions, they are not linked to death, emphasizing the need for adherence to hygiene and rigorous policies for infection surveillance. 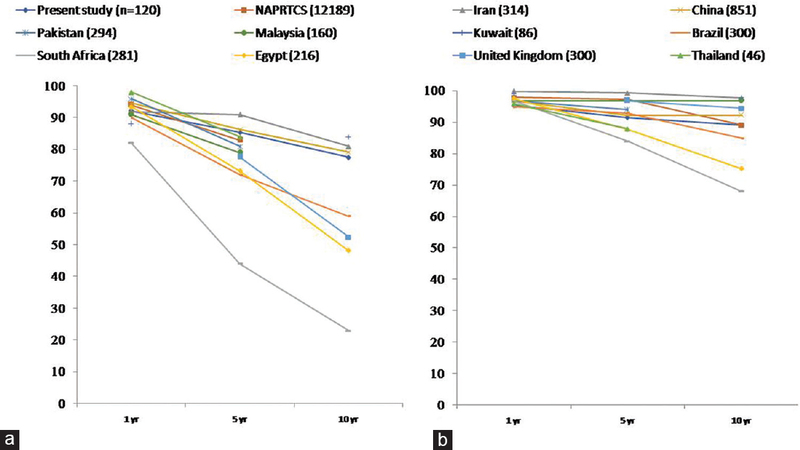 At transplantation, our patients were significantly stunted, with lower median height SDS (−2.5) than for patients reported in NAPRTCS (−1.4) or from Egypt (−1.75); data on height are not reported in other studies from developing countries. Similar to the report from NAPRCTS, stunting was more pronounced for boys than girls, probably reflecting predominance of early-onset CAKUT (posterior urethral valves, vesicoureteric reflux) in boys. The higher height deficit in older than younger children may reflect delayed diagnosis of predominantly CAKUT conditions. While our patients experienced a significant but small improvement in height SDS, the increase is more pronounced in reports from developed countries, likely due to corticosteroid minimization or withdrawal,,, use of recombinant growth hormone after transplantation,,, better nutrition and younger age at transplantation.,, Compared to reports from previous studies,, we found paradoxically significant increase in height SDS for older (>12 years) rather than younger patients, potentially reflecting delayed bone maturation with continued growth. This retrospective review of pediatric transplantation at a single center suggests that kidney transplantation in a developing country in south Asia is associated with similar patient and allograft survival as compared to developed regions. However, the retrospective nature of data collection may have influenced results due to missed visits and/or incomplete information on metabolic complications, quality of life and medication adherence. Severe infections causing serious morbidity and mortality remain a concern. Rates of immunological, infectious and other complications are similar to those experienced in other developing and developed regions. Outcomes are expected to improve with increased attention to medication compliance and hygiene and close surveillance for infections and allograft dysfunction. Van Arendonk KJ, Boyarsky BJ, Orandi BJ, James NT, Smith JM, Colombani PM, et al. National trends over 25 years in pediatric kidney transplant outcomes. Pediatrics 2014;133:594-601. Franke D, Thomas L, Steffens R, Pavičić L, Gellermann J, Froede K,et al. Patterns of growth after kidney transplantation among children with ESRD. Clin J Am Soc Nephrol 2015;10:127-34. Qvist E, Närhi V, Apajasalo M, Rönnholm K, Jalanko H, Almqvist F,et al. Psychosocial adjustment and quality of life after renal transplantation in early childhood. Pediatr Transplant 2004;8:120-5. Dharnidharka VR, Fiorina P, Harmon WE. Kidney transplantation in children. N Engl J Med 2014;371:549-58. Moudgil A, Dharnidharka VR, Lamb KE, Meier-Kriesche HU. Best allograft survival from share-35 kidney donors occurs in middle-aged adults and young children-an analysis of OPTN data. Transplantation 2013;95:319-25. Chacko B, Rajamanickam T, Neelakantan N, Tamilarasi V, John GT. Pediatric renal transplantation – a single center experience of 15 yr from India. Pediatr Transplant 2007;11:844-9. Naderi G, Latif A, Karimi S, Tabassomi F, Esfahani ST. The long-term outcome of pediatric kidney transplantation in Iran: Results of a 25-year single-center cohort study. Int J Organ Transplant Med 2017;8:85-96. Rizvi SA, Sultan S, Zafar MN, Naqvi SA, Lanewala AA, Hashmi S,et al. Pediatric kidney transplantation in the developing world: Challenges and solutions. Am J Transplant 2013;13:2441-9. Nissel R, Brázda I, Feneberg R, Wigger M, Greiner C, Querfeld U,et al. Effect of renal transplantation in childhood on longitudinal growth and adult height. Kidney Int 2004;66:792-800. Sinha A, Hari P, Guleria S, Gulati A, Dinda AK, Mehra NK,et al. Outcome of pediatric renal transplantation in North India. Pediatr Transplant 2010;14:836-43. Khandelwal P, Sinha A, Hari P, Bansal VK, Dinda AK, Bagga A,et al. Outcomes of renal transplant in patients with anti-complement factor H antibody-associated hemolytic uremic syndrome. Pediatr Transplant 2014;18:E134-9. Sarwal MM, Ettenger RB, Dharnidharka V, Benfield M, Mathias R, Portale A,et al. Complete steroid avoidance is effective and safe in children with renal transplants: A multicenter randomized trial with three-year follow-up. Am J Transplant 2012;12:2719-29. Scaggs HFA, Danziger-Isakov L. Infectious disease risks in pediatric renal transplantation. Pediatr Nephrol 2018. DOI: 10.1007/s00467-018-3951-1. Haas M, Loupy A, Lefaucheur C, Roufosse C, Glotz D, Seron D,et al. The Banff 2017 kidney meeting report: Revised diagnostic criteria for chronic active T cell-mediated rejection, antibody-mediated rejection, and prospects for integrative endpoints for next-generation clinical trials. Am J Transplant 2018;18:293-307. Thergaonkar R, Bhardwaj S, Sinha A, Bansal VK, Hari P, Bagga A. Post-transplant lymphoproliferative disorder: Experience from a pediatric nephrology unit in North India. Indian J Nephrol 2018. DOI: 10.4103/ijn.IJN_143_17. North American Pediatric Renal Trials and Collaborative Studies. Annual Transplant Report; 2014. Rees L, Shroff R, Hutchinson C, Fernando ON, Trompeter RS. Long-term outcome of paediatric renal transplantation: Follow-up of 300 children from 1973 to 2000. Nephron Clin Pract 2007;105:c68-76. Englund MS, Tydén G, Wikstad I, Berg UB. Growth impairment at renal transplantation – A determinant of growth and final height. Pediatr Transplant 2003;7:192-9. Srivastava A, Prabhakaran S, Sureka SK, Kapoor R, Kumar A, Sharma RK,et al. The challenges and outcomes of living donor kidney transplantation in pediatric and adolescent age group in a developing country: A critical analysis from a single center of North India. Indian J Urol 2015;31:33-7. Vasudevan A, Iyengar A, Jose B, Phadke K. Pediatric renal transplantation: A single-center experience. Transplant Proc 2008;40:1095-8. Harambat J, Ekulu PM. Inequalities in access to pediatric ESRD care: A global health challenge. Pediatr Nephrol 2016;31:353-8. Sethi SK, Sinha R, Rohatgi S, Kher V, Iyengar A, Bagga A,et al. Pediatric renal transplant practices in India. Pediatr Transplant 2017;21. DOI: 10.1111/petr.12892. Bijalwan P, Sanjeevan KV, Mathew A, Nair TB. Outcome and complications of living donor pediatric renal transplantation: Experience from a tertiary care center. Indian J Urol 2017;33:221-5. El-Husseini AA, Foda MA, Bakr MA, Shokeir AA, Sobh MA, Ghoneim MA,et al. Pediatric live-donor kidney transplantation in Mansoura Urology & Nephrology Center: A 28-year perspective. Pediatr Nephrol 2006;21:1464-70. Sumboonnanonda A, Lumpaopong A, Kingwatanakul P, Tangnararatchakit K, Jiravuttipong A. Pediatric kidney transplantation in Thailand: Experience in a developing country. Transplant Proc 2008;40:2271-3. Lee LM, Tung LL, Pee S, Chin YY, Ismail WJ. Paediatric renal replacement therapy. In: 23rd Report of the Malaysian Dialysis and Transplant Registry; 2015. Khan IA, Al-Maghrabi M, Kassim MS, Tawfeeq M, Al-Saif F, Al-Oraifi I,et al. Recipient characteristics and outcome of pediatric kidney transplantation at the King Fahad Specialist Hospital-Dammam. Saudi J Kidney Dis Transpl 2014;25:895-9. Dharnidharka VR, Naik AS, Axelrod DA, Schnitzler MA, Zhang Z, Bae S,et al. Center practice drives variation in choice of US kidney transplant induction therapy: A retrospective analysis of contemporary practice. Transpl Int 2018;31:198-211. Rosati P, Pinto V, Delucchi A, Salas P, Cano F, Zambrano P,et al. Pediatric renal transplantation: 13 years of experience – Report from the Chilean cooperative multicenter group. Transplant Proc 2005;37:1569-73. Webb NJ, Douglas SE, Rajai A, Roberts SA, Grenda R, Marks SD,et al. Corticosteroid-free kidney transplantation improves growth: 2-year follow-up of the TWIST randomized controlled trial. Transplantation 2015;99:1178-85. Pape L. State-of-the-art immunosuppression protocols for pediatric renal transplant recipients. Pediatr Nephrol 2017. DOI: 10.1007/s00467-017-3826-x. Vilalta R, Lara E, Madrid A, Chocron S, Vazquez A, Casquero A,et al. Delayed graft function is reduced with antithymocyte globulin induction in pediatric kidney transplantation. Transplant Proc 2009;41:2373-5. Mota C, Martins L, Costa T, Dias L, Almeida M, Santos J,et al. Nineteen years of experience utilizing anti-T-lymphocyte globulin induction in pediatric kidney transplantation. Ann Transplant 2010;15:84-91. Shishido S, Satou H, Muramatsu M, Hamasaki Y, Ishikura K, Hataya H,et al. 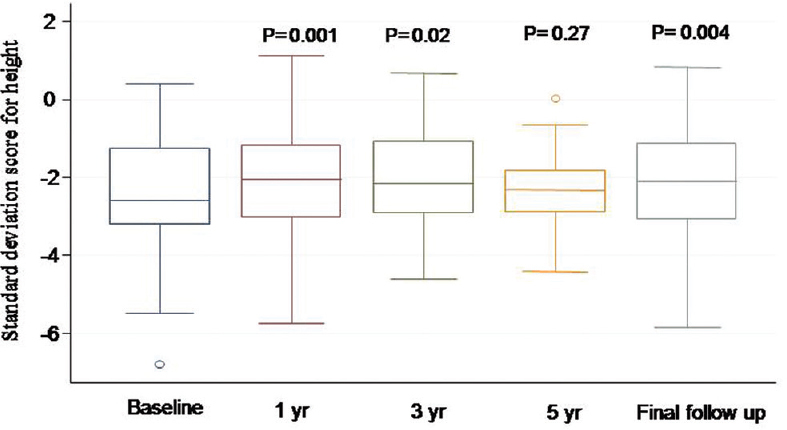 Combination of pulse methylprednisolone infusions with cyclosporine-based immunosuppression is safe and effective to treat recurrent focal segmental glomerulosclerosis after pediatric kidney transplantation. Clin Transplant 2013;27:E143-50. Rathi M, Rajkumar V, Rao N, Sharma A, Kumar S, Ramachandran R,et al. Conversion from tacrolimus to cyclosporine in patients with new-onset diabetes after renal transplant: An open-label randomized prospective pilot study. Transplant Proc 2015;47:1158-61. Veroux P, Veroux M, Puliatti C, Valvo M, Macarone M, Cappello D,et al. Severe neurotoxicity in tacrolimus-treated living kidney transplantation in two cases. Urol Int 2003;71:433-4. Tamura S, Sugawara Y, Kishi Y, Akamatsu N, Kaneko J, Murai N,et al. Conversion to cyclosporine provides valuable rescue therapy for living donor adult liver transplant patients intolerant to tacrolimus: A single-center experience at the University of Tokyo. Transplant Proc 2004;36:3242-4. Garcia CD, Bittencourt VB, Tumelero A, Antonello JS, Moura DM, Vitola SP,et al. 300 pediatric renal transplantations: A single-center experience. Transplant Proc 2006;38:3454-5. Pitcher GJ, Beale PG, Bowley DM, Hahn D, Thomson PD. Pediatric renal transplantation in a South African teaching hospital: A 20-year perspective. Pediatr Transplant 2006;10:441-8. Samhan M, Fathi T, Al-Kandari N, Buresley S, Nampoory MR, Nair P,et al. Renal transplantation in children. Transplant Proc 2007;39:911-3. Liu L, Zhang H, Fu Q, Chen L, Sun C, Xiong Y,et al. Current status of pediatric kidney transplantation in China: Data analysis of Chinese scientific registry of kidney transplantation. Chin Med J (Engl) 2014;127:506-10.